Two 24" x 30" Mat 1" squares on each side. 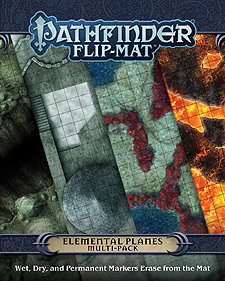 Bring your player to the great beyond with Pathfinder Flip-Mat: Elemental Planes Multi-Pack! Each side of these two Flip-Mats depicts an exciting location on one of the Elemental Planes. From a coral reef cave on the Plane of Wate to volcanic wastelands on the Plane of Fire, and from a cloud castle on the Plane of Air to a stalagmite forest on the Plane of Earth, wonders and perils abound. Pathfinder Flip-Mats fit perfectly into any Game Master's arsenal, giving you vibrant maps you can use again and again! Don't waste your time sketching when you could be playing. With the Pathfinder Flip-Mat: Elemental Planes Multi-Pack, now you can focus on what matters the most: the action in your game.